Each year the club awards points to Birman exhibits shown in Queensland at various cat shows throughout the year, which go towards an overall end of year tally. We award a trophy for best male and female in Kitten, Entire Adult and Adult Desexed classes. The awards are given for the exhibits that have scored the highest points throughout the year in a number of rings and are given in recognition by our club to the exhibit and exhibitor. It is also hoped these awards will be seen as an encouragement for our members to show their Birman as it is only awarded to club members. The trophies are presented at our end of year meeting and luncheon. 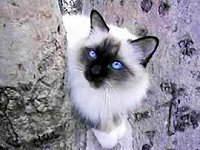 Please find photos of some of the award winning Birmans since its inception in 2000.